I am definitely hooked on essential oils. I’ve been using them for a little while now, and have been able to totally revamp my household cleaning and skincare routine. It’s so satisfying to be able to make my own products and support whole body wellness with these oils. I use them on a daily basis for all different things, and my husband uses them too. We choose to use Young Living essential oils, which are high-quality, therapeutic grade. I love what these oils have done for us and want to keep spreading the good word! Young Living sets the standard for essential oil purity and authenticity by carefully monitoring the production of their oils through their unique Seed to Seal process. Read more about the Seed to Seal process here. You have two options for getting started: as a wholesale member or as a retail customer through the Young Living website. Your best bet is to join as a wholesale member because it allows you a 24% discount on every product offered. Keep in mind, becoming a member is NOT signing your life away and you have no obligations to sell, place orders every month, have a minimum order or even buy more. But, to maintain your member status and get your discount, you have to place an order of 50 PV (product value) or more per year. This isn’t much at all (equates to around $50 or so). Retail members, on the other hand, pay regular retail prices and don’t get any sort of discount on products. To start as a wholesale member, you first need to purchase a starter kit. Your best bet is the premium starter kit, which I highly recommend. You get 11 essential oils, a diffuser and more — all for nearly 50 percent off the retail price! It’s the kit of all kits and no other starter kit contains this many oils. This is the kit I started with and it’s been fantastic. You really do get a lot of bang for your buck. The Premium Starter Kit is valued at over $300. As a wholesale member, you get this at about 50 percent off for $160! You also get to choose your own diffuser too. The kits with the home and dewdrop diffuser are the same price, but the price goes up for the Bamboo or Aria diffuser (the dewdrop diffuser is seen in the picture below). 1. Click on the sign-up page. You will need a sponsor in order to start. My member number should appear on the page, 2225243. 2. Choose, “Sign Up As: Young Living Wholesale Member.” This will make you a distributor (really, you’re just a member, unless you decide to embark on the business side of things). If you select retail customer, you will not receive the wholesale discount. 3. The “Enroller ID” and “Sponsor ID” boxes should already be filled in for you (enter 2225243 if the boxes are empty). 4. Fill out your name, billing address, shipping address and contact info. You are asked to enter your social security number for tax purposes. If you make over $600/year selling Young Living products, you will receive a 1099 in the mail, which is required by law. Young Living will never share this info with anyone and this is protected just like in an employer/employee relationship. You do have the option to use a tax ID instead or you can call customer service and give the info over the phone: 1-800-371-3515. You can get an EIN from the IRS in just a few seconds HERE and use that number instead (the IRS just needs to be able to connect some number with you for tax purposes). 5. Create a password and pin, which you will use to log into your account and order product. Make sure to write this down! 6. Select your enrollment order. This is where you specify which Starter Kit you want. Again, I recommend the Premium starter kit. Remember, you must sign up with a kit to become a wholesale member. To maintain your 24 percent discount going forward, you only need to place a 50 PV minimum order each year on any product in the Young Living store. You will have no monthly obligation to buy or sell ever and there are no additional fees! 7. If desired, set up your optional Essential Rewards Program. ER is not a requirement to sign up as a wholesale member. This is a rewards program you can opt into to start earning money back to help pay for your oils. You can skip this step by selecting, “No, thank you. I plan on enrolling in the Essential Rewards Program later.” Read more about essential rewards here. 9. Confirm your order and enrollment info. To confirm, the tool will log you in and show you your order again, and will make you enter in your payment information again. 10. Add any additional product that you would like with your starter kit (capsules, other oils, etc.). 11. Check out and you are DONE! Hooray, now you’re a member! Remember, your membership will renew each year as long as you order a 50 PV (product value) or more order in a calendar year. Trust me, this won’t be a problem! The kit is a one-time deal and you do not have to buy another one each year to continue. While you’re waiting for your kit to arrive, I recommend checking out this free eBook, 100+ Uses for Everyday Oils. This is a great way to start learning about the oils that come in your kit and how you can use them. Plus, get a FREE bonus welcome gift from me! 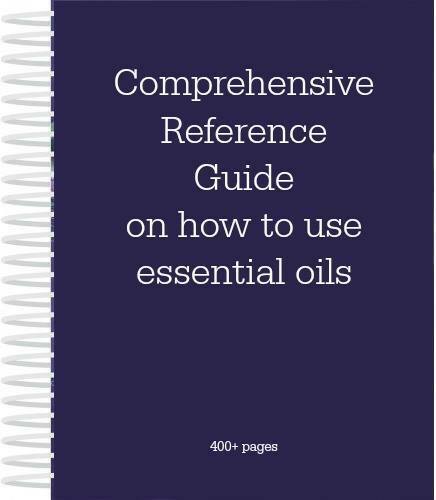 Also, as a thank you for signing up on my essential oils team, I will send you a 400-page Essential Oils Reference Guide ($20 value) to help you get to know your oils. You can look up each individual oil and blend, as well as search by symptoms and conditions. I use my reference guide almost every day. My sponsor gifted this to me when I got started, and it has been the most useful tool in getting to know my oils. (*Note that I can only ship this gift to members located in the United States. Canada folks message me for alternatives at paleoinportland (at) gmail (dot) com). Meanwhile, if you have any questions, please don’t hesitate to contact me. Also, let me know if you want to be added to my secret essential oils Facebook group!